The Ultimate Yogi is the most comprehensive yoga DVD set on the market. 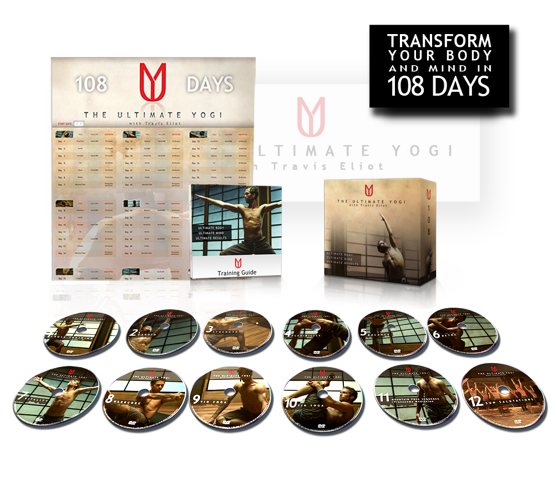 Renowned yoga instructor, Travis Eliot will take you to your physical limits and beyond on this 108-Day Journey. Each of the 14 thematic yoga classes are comprised of creative sequences that will challenge the expert and encourage the beginner. The Ultimate Yogi is MORE than just a fitness program, it is a transformational experience guaranteed to improve your quality of life. A complete class-by-class summary of the Ultimate Yogi 108-day program. The Program Calendar will guide you through the entire program on a day by day basis. Natural unprocessed foods are part of the Ultimate Yogi lifestyle. Every 36 days you are encouraged to participate in a 3-day cleanse including vegan, raw food and juice feast. Take your before and after pictures to track your progress and we guarantee on day 108 you won’t be disappointment.